The competition goes for 5 weeks and is for everyone from beginners to advanced. 3 weeks of round robin, 1 semi finals week, 1 final week. 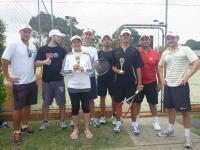 We provide the courts and the balls and one coach organises and supervises the competition. The Tournament will be organised in a Round Robin format which will be best of 5 games (1 set for Semi & Final). You can register as a team of 2 or as an individual player and we will find you a partner. Every night is composed of 2 singles and 1 doubles match.